Creating a Design Code for sensitive development. Working with two developer clients, a masterplan and design code set out the principles for the development of a 12.2 hectare greenfield site in Cheltenham. 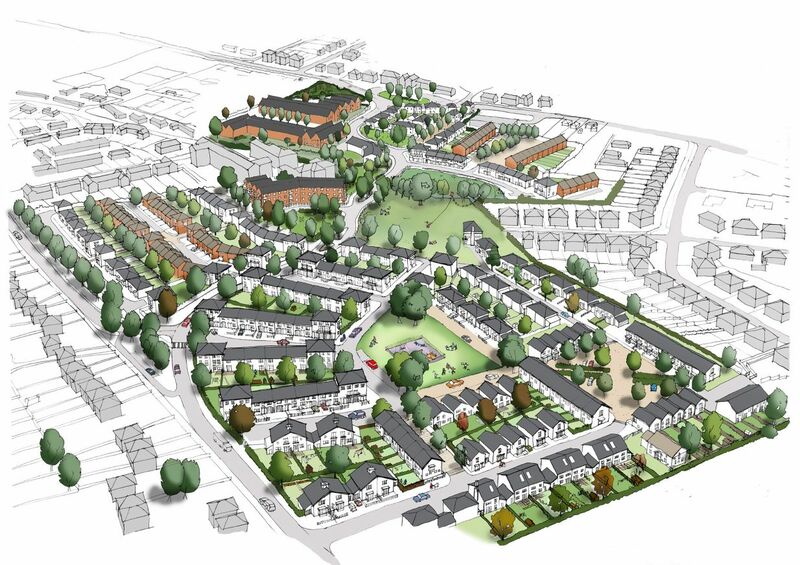 Having secured Reserved Matters approval in 2014, the construction of 300 new homes plus a 50-bed extra care facility at Starvehall Farm is underway and due for completion in 2019. Starvehall Farm is a 12.2. hectare greenfield site located on the northern fringes of Cheltenham. The site is unique, with long distant views to the Cotswold escarpment and undulating typography. Recognising the sensitivities of development, we held a number of consultation sessions with the local community, Parish council and the Planning Authority. These inputs were central to the development of the masterplan and securing outline permission in 2012. The masterplan responds to the unique setting of the sloping site, optimising views for 300 new homes, including affordable housing and a care facility. Attractive, safe and convenient pedestrian routes connect public open spaces and create links to local facilities. A link road relieves through traffic from Prestbury village as part of a strategic requirement from Gloucestershire County Council from the outset. The scheme uses the principles set out in the Design Code to create a series of distinctive character areas. The design principles and aspirations aim to ensure the finished scheme achieves standards of urban design, amenity and community assets. It required close compliance with a previously approved design code, the navigation of complex Section 38 and 278 highways agreements and had to overcome constraints associated with affordable housing provision and complex drainage and landscaping issue. Following Reserved Matters in approval in 2014, our team of urban designers, planners and architects are working closely together with Bovis Homes and Bloor Homes to make sure that their standard house types respond to the particular requirements of the site, as set out in the Design Code. The development is due for completion in 2019.